Disclosure: This post is sponsored by JOANN. All of the glorious supplies were provided by them. Any glass jar will work, but I selected wide mouth mason jars to provide the most space for building the terrarium. Remove the mason jar lid, and take a ball of the air dry clay. 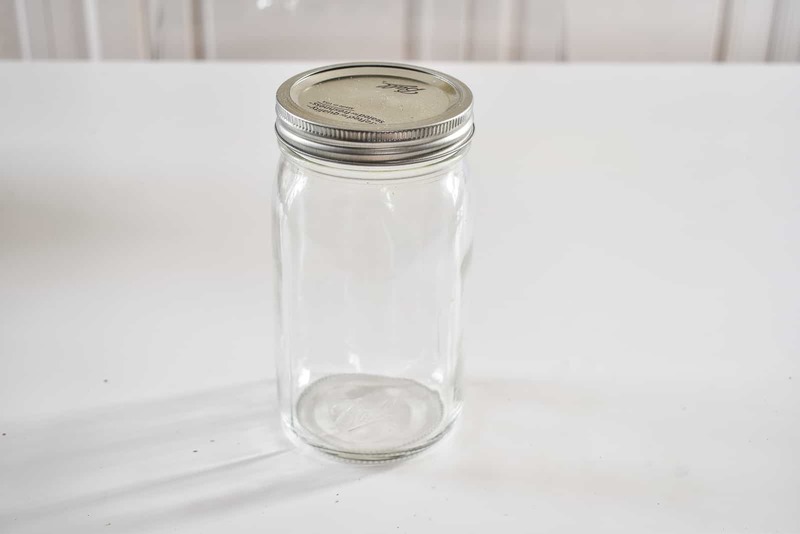 Press the ball onto the lid of the mason jar being careful you leave room around the edge of the lid for the jar to thread back in place. 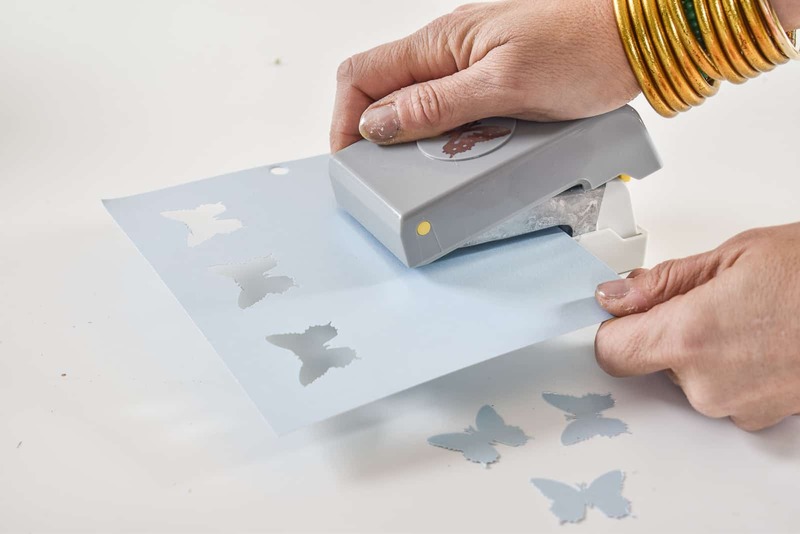 Thankfully JOANN has butterfly shaped paper punches so I didn’t have to cut out the butterflies by hand. 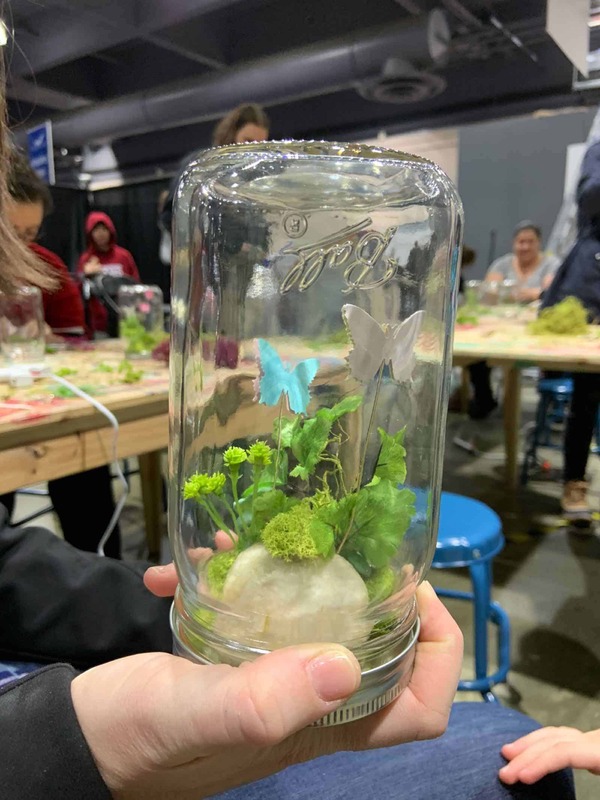 That said, if you’re creating this at home, cutting out 6-8 butterflies isn’t such a big deal, but for the purpose of creating 40+ terrariums… the paper punch was KEY. I used decorative card stock. 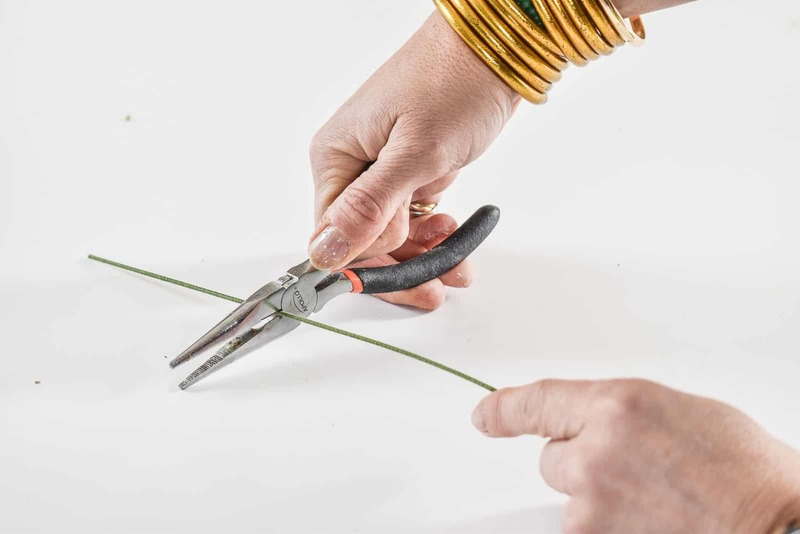 Using wire cutters, cut your floral wire to size. You want a few varied lengths of wire that will fit inside the mason jar. 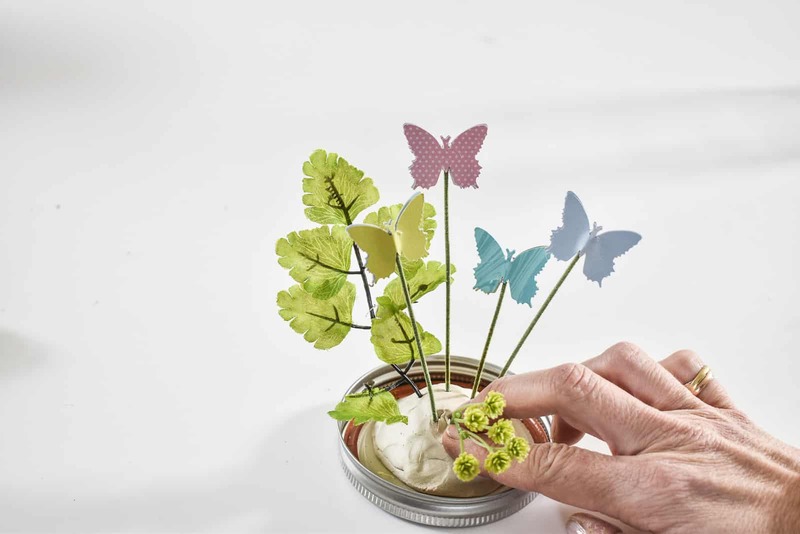 Place a small bead of hot glue into the center of a butterfly and place the end of your floral wire onto the glue. 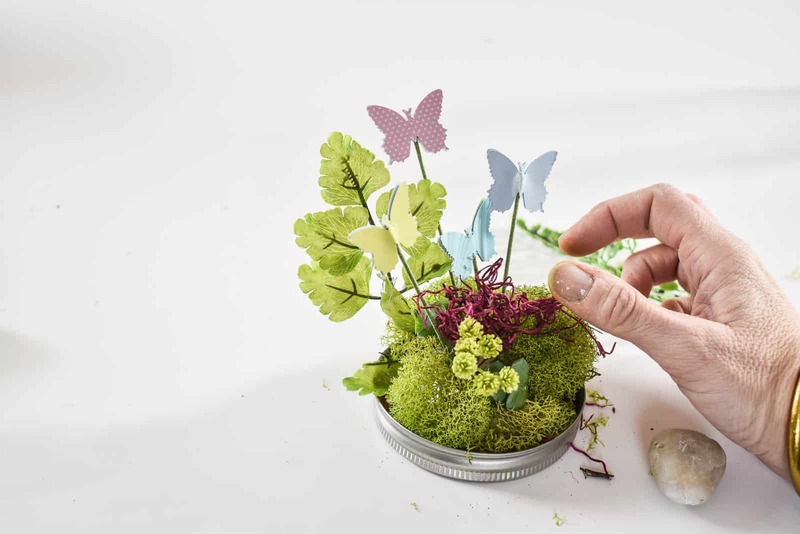 Immediately place a second butterfly on top of the glue/ floral wire to pinch the wire between the two butterflies. Make as many as you like! 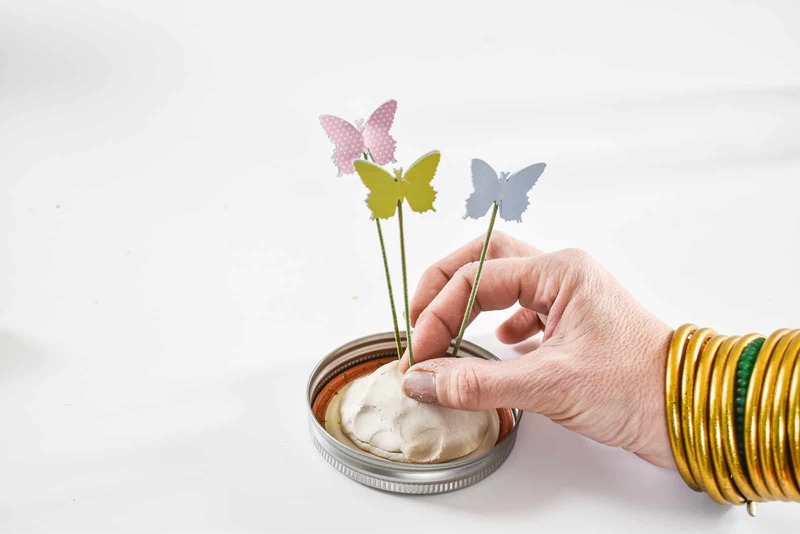 Stick the ends of the floral wire butterflies into the clay on the mason jar lid. Add faux greenery. 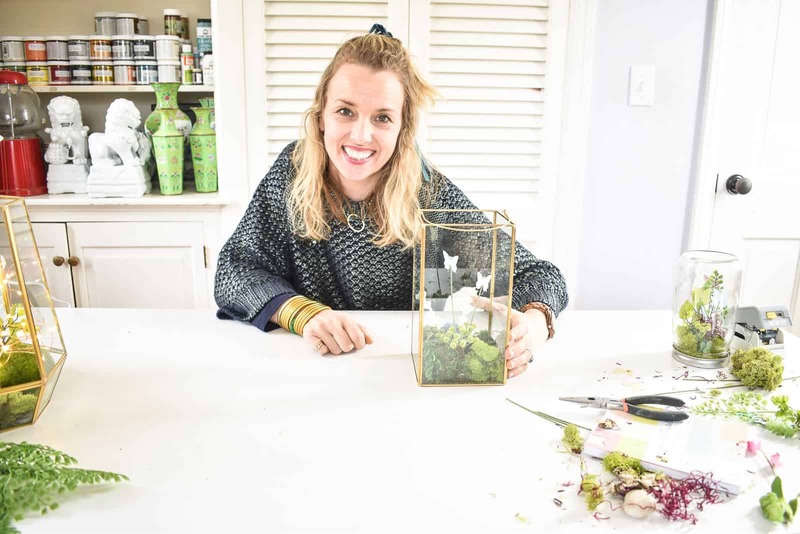 (Using your wire cutters, trim greenery from larger faux florals.) 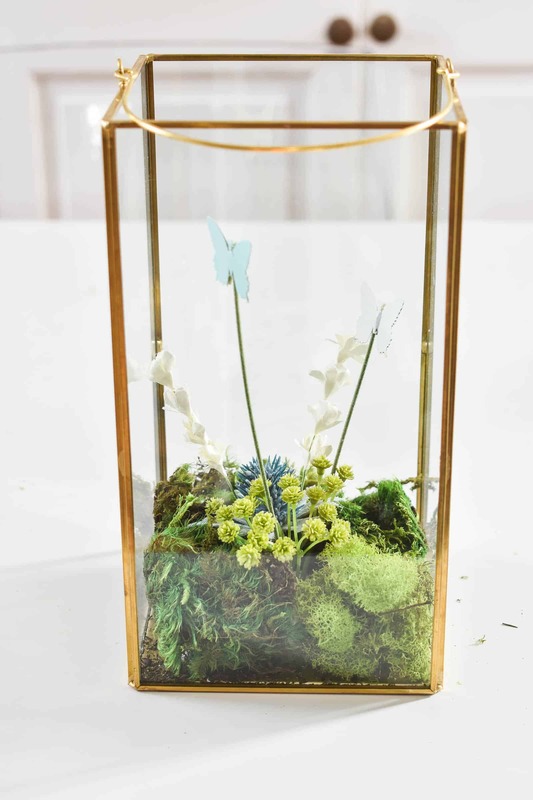 Add faux flowers, moss rocks, pebbles and even small faux insects. Finish my covering any visible clay with moss. 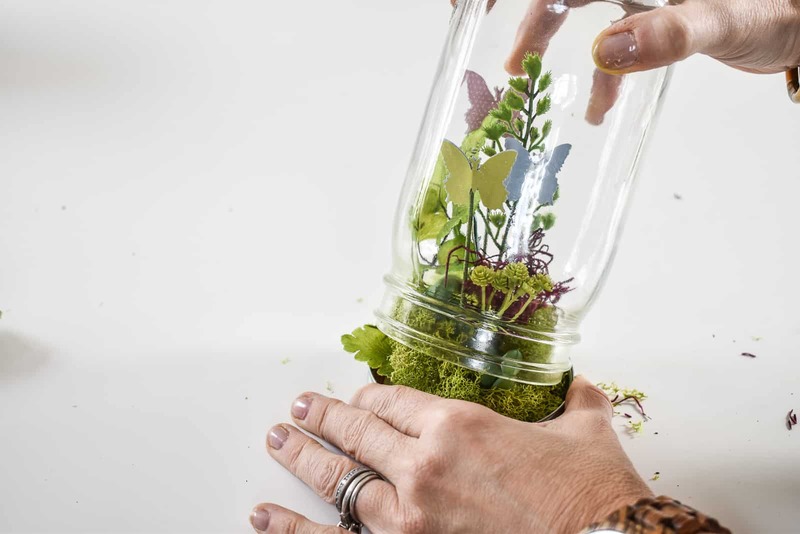 Careful screw the inverted mason jar in place on your terrarium lid. 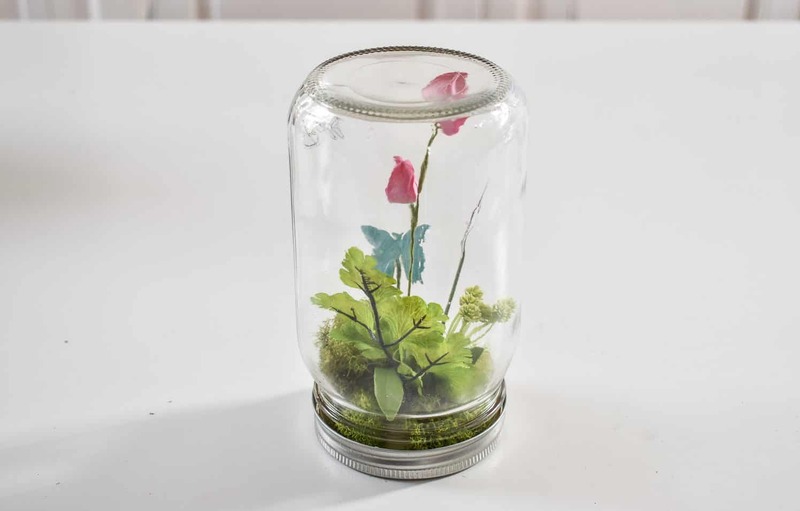 Go slowly and tuck the greenery into the jar before screwing it in place. Optional: Tuck a small strand of batter powered micro-LED lights into your terrarium for an even more magical effect. The clay should dry in the next couple of days and keep everything in place, but if you find the pieces of your terrarium have come loose at all, remove the jar and go back with some hot glue to secure. 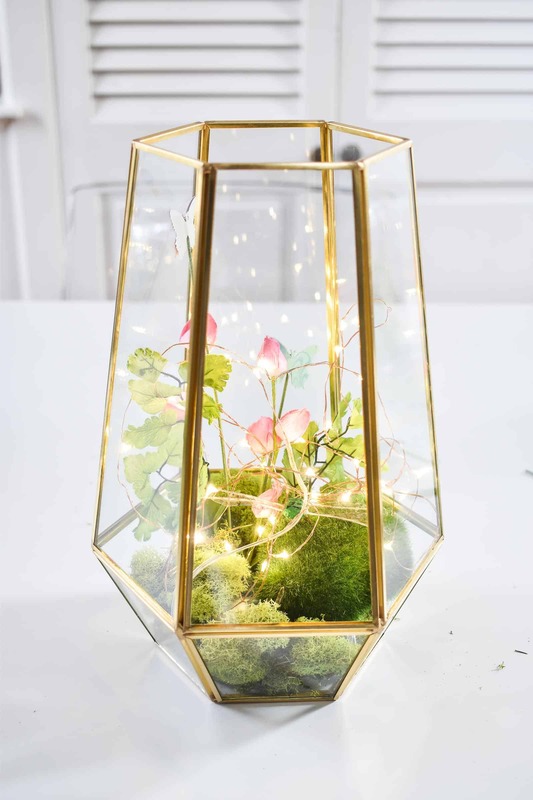 I created some larger terrariums following the same steps, just using these amazing gold lanterns instead of the mason jars. 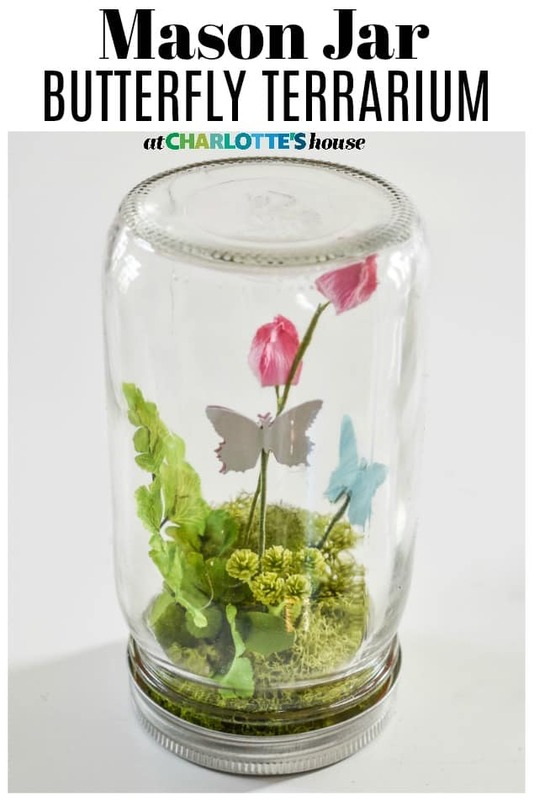 I had one displayed in my design space and I love how delicate they look! So cute! 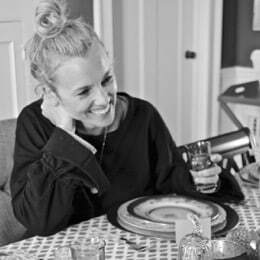 Such a fun centerpiece fir so many different occasions! Thanks, Melissa! I loved this one! These are so gorgeous, I’m glad you put a tutorial up! Yay! Thanks, Christine! I loved the kids and adults alike could make these so well! Great idea! Just in time for spring!! Yes! They looked so sweet in the center of the table! Thank you charlotte. I love this idea and will try it out. Oh great! Send me pics if you do! Thanks!